Don’t you recall hearing the horror stories of your friends who had kids and reluctantly chucked their fitness out the window? You may have then thought that they were using motherhood as an excuse to not break a sweat and you may have even thought that you’d never let kids stand in the way of your workouts. But here you are with kids and you’re seeing that finding time to exercise is an emotionally wrenching struggle. Good news: Instead of pining for those two-hour trips to the gym, simply put these five fast and fun workouts on your busy mom schedule. 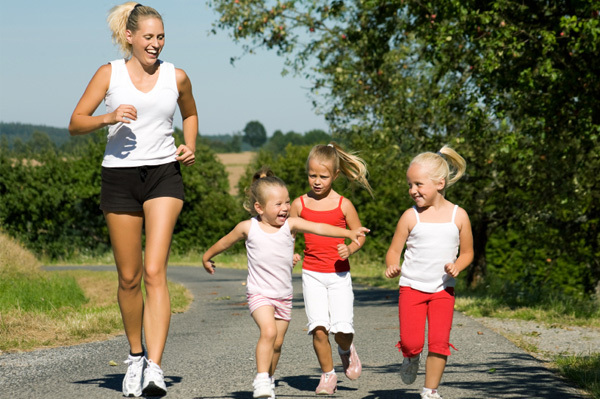 Rally your neighbors, friends and even family members with kids to work out with you. Whether you organize a mommy-and-stroller walking group or let play dates do double duty as fitness opportunities, aim to get in an efficient 20- to 30-minute sweat. Depending on the age of your kids, you and your mom friends can join in on a game of Frisbee, kickball or tag. The time you spend “playing” with others is just as good for your emotional health as it is for your body. Even if your mom friends are too busy to join you, take advantage of having kids with boundless energy and exercise with them. Not only will you be spending quality time with them, but you’ll also be instilling in them the importance of having an active lifestyle. You can challenge them to Wii fitness games or dare them to keep up with you while doing a home exercise DVD. Even more fun, have “animal races” — crawl like a bear, hop like a frog, flap like a bird or slither on your stomach like a snake to the finish line. You’ll be surprised how much of a workout you’ll get from imitating our furry, feathered or scaly friends. The trip to and from the gym eats up precious minutes of your day. Skip the commute and work out at home. From fitness DVDs to online exercise videos, you can get in shape in the same amount of time it takes for you just to get to the gym. You can also set up your own home circuit routine with one or two sets of dumbbells, a fitness ball and a mat. Need a cardio boost? Run or quickly walk your stairs, or sprint up and down your hall. Working out at home also means you can work out when you want and for as long (or short) as you want. Your canine pal needs exercise as much as you do. If you’ve both been packing on the pounds, it’s time to leash up and get moving. The best part? You don’t have to take your dog out for an impossible-to-schedule one-hour run. Schedule 15 minutes and then powerwalk or walk/jog through your neighborhood. Your dog doesn’t care where or for how long you walk, he or she will be thrilled just to be outdoors, enjoying the fresh air. Think about how much more motivated you were to stay on the elliptical in the pre-mom days when time was rarely a factor. The same concept can also be applied to your everyday mom duties. While you are picking up after your kids, cleaning, cooking, organizing and doing other domestic diva tasks, listen to your favorite move-it-and-groove-it tunes. You’ll not only put more energy into your activities (and burn more calories), you may just find yourself indulging in dance breaks throughout your day.